As usual it was another wonderful evening wake from the courtyard of our apartment complex, where I wander usually in wheels as a favorite pastime listening to various sort of birds chirping form the lust green wasteland opposite to my house including the frequent and rapid cheep by squirrels from the trees and sight of birds. The list of birds could be least to count but the songs they chirrup are enthusiastic and resonates eternal joy listening to more than one bird and sometime I try to mimicry there chirp as a replay call at themselves and wonder where will I go to listen to them if constructions come into this site and where the birds will disappear. There not alone humans but nature also inbuilt its curse to tackle each other animals to live nod me to realize hardly again by a curse incident that affect me very close to heart and sight. I couldn’t take it easily because of the fateful happen in front of me and the cheeping aloud squirrel that continue to resonant in mind and remind me the incident every time I get to hear the creep sound around. 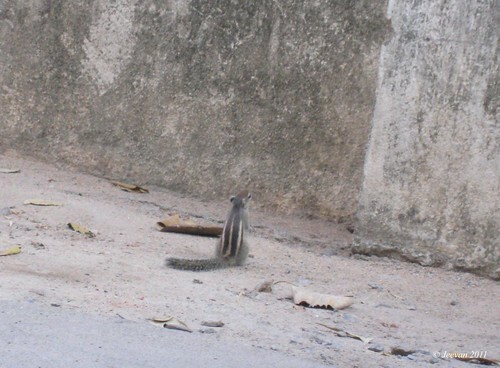 It was really a sweet moment when I see these two little squirrels near our compound wall, leaping here and there to climb the wall, in which one seems elder to another. The young one was trying hard to climb the wall by various attempts in the present of another, which had already climbed on and thus I wanted to capture the scene and so asked dad to bring the cam. 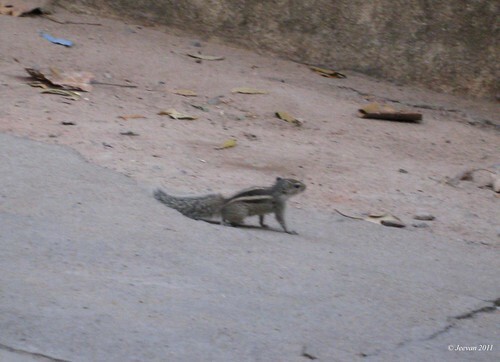 The little squirrel fascinated me a lot through its cute and small unlike ever seen appearance. It was the moment I come around a car that parked in the apartment to capture the squirrel closely and I took couple of shots of the squirrel which was trying hard to climb quickly with just seconds to go for another shot, a black cat pounced from behind the car caught the little squirrel and run away… I was shocked by this sudden attack and couldn’t express anything at moment inadequate to response in grief. I was touched by this not less similar incident of Big Cats attack animals in one pounce catching the throat and it was such the black cat’s hiss on the little squirrel. After sometime dad came to ask did u captured the squirrel, I replayed it’s gone, where he asked again and I said it’s gone. The cat took it away. Oh! What touched a lot was the other squirrel which was cheeping rapidly moving its tail up and down from the tree in the distress of missing its well bond little partner. I wonder now whether the little one might know a cat could take it into prey that’s y it was trying hard to climb the wall! I FEEL VERY SORRY FOR THE PITY LIFE OF THIS LITTLE SQUIRREL, WHICH MADE MY DAY THROUGH ITS SIGHT AND CUTE GESTURES. It was partially wonderful traveling from Thanjavur to Palani after our breakfast in Hotel Saravana Bhavan – popular for delicious taste across the state; we directed by our friendly caretaker in Thanjavur to reach Trichy. My only intention was to visit Thanjavur Big Temple on its 1000th year, so I missed many wonderful places within Thanjavur, including the Palace and Raja Raja Cholan memorial hall which we passed with an unease mind of just lookout structure. On the way in the NH towards Trichy we find an interesting building in the name of Tamil University. 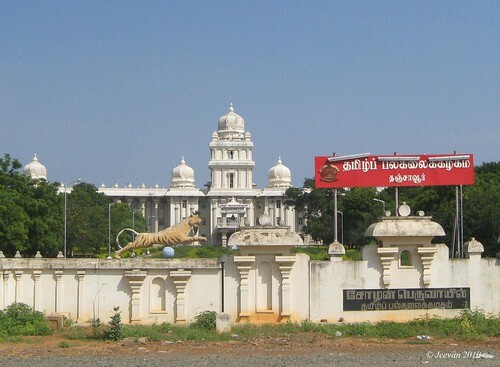 Living in Tamil Nadu and speaking the language, I never know there is a university in name of Tamil dedicated to the classical language and to do advanced studies and research on its linguistics, literature, translation and art including conducting various programs regard to language, literature and sculpture. We stopped sometime to glance the building in a modern temple like structure with two tiger pounce statues on either side of compound. The roads were partially good even under constructions and after crossing Trichy it was pleasant and calm but certain diversion between lanes disturb and a small mistake divert us on Madurai road instead of Dindigul to later take a U turn in a km. It was really an uncertain signboard with least different in showing the direction could confuse any unfamiliar in this route. I liked the floating clouds in this route and its dark shadows falling on the hills are a very nice and the big Murugan statue that stands on this way is one of an attraction which I missed couple of times to capture before. This stretch of road just feels like so dry with lack of green fields and farms but the hills provide a good set of views. 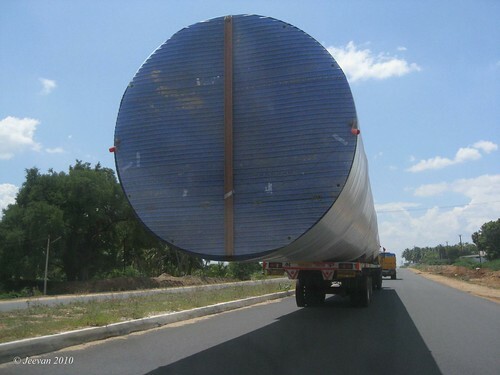 The huge pipes transported in two trucks cause a wonder and got to think what purpose these pipes except the thought of windmill poles. 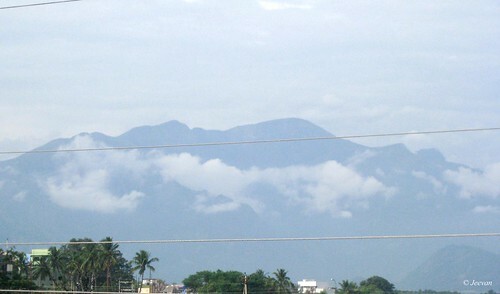 I really enjoyed my stay in Palani and going around the places was an enchanting trail in the witness of Western Ghats that almost visible from everywhere and sometimes mist capped. We reached Palani in afternoon and stayed in the New Tirupur Lodge booked by my dad’s friend’s relatives there and had our lunch in Hotel Nalapakam, which is in the ground floor of the same building. 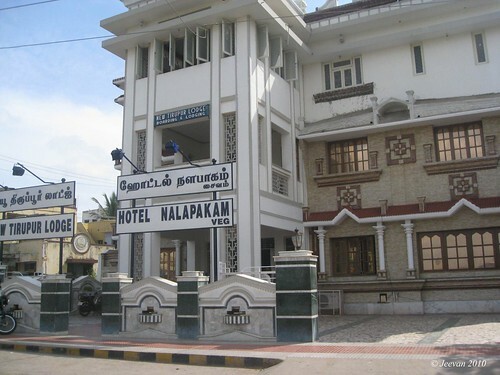 I must really need to say about the Hotel Nalapakam which treated us in a very kind manner that I never felt like ever. The servers there are very friendly and esp. towards me, their way of showing concern and care at my content feed is enhance and moved me enormous to feel like at home. They have separate places for breakfast and lunch, and being difficult for me to enter the lunch hall; they allowed having my lunch in breakfast hall, and one of the servers was pointed to take care of my need and an old man in grandpa age brought tub for me to wash hand. I wonder how many restaurants treat people like this in a very kind and home alike attitude and care. I feel gratitude towards their attitude to make certain that we feed content and more or less the price comes only next and they don’t stretch bills and what we pay in fair to cashier is taken into account. This showcase their trust in there customers but as fair as we are such attitudes will continue and I sure there must be someone noticing us silently. We took leisure sometime after our lunch in the room before proceed to Hill Temple. We stayed in the first floor of the lodge which has a lift facility to make certain comfort and pleasure comes for the balcony of the lodge which cause cool breeze and views of the Western Ghats and the lake opposite. Presented in the main road lead to the foothill of Palani, the street provides a good time pass in the presence of shops, horse carts and people and being unseasonal the place lacks crowd. Now it is election season in five states across country and among them Tamil Nadu has been our ground base with political parties at rush to settle for alliance and selecting their candidates to run for the legislative assemble election hold for April 13th. The ruling party had well concluded there alliance and the oppositions at their end of conclusion, the furor about election have been at higher level across state with strict rules followed by Election Commission. It’s time to decide on whom to rule the next half decade and what I think to be taken into mind is who deserves better than bad and worse. There is no perfect politician when even a man could not be and whether more or less corruption is wrong, and we can’t balance it either to go with but less corrupted is better to decide. What u says? People poll vote expecting that the government would do something on their behalf and so far every government had done their best to deserve people attention and whatever the intention could be, selfless person is indeed hard to find and what need to see is who creates better opportunities than making already exist worst by affect others. What really bothers me about the election was the free of cost schemes proclaimed by the ruling government that instinct to continue as a vote banking idea would make people easier deaf dumb and prevent from thinking. In my view I see the free of cost schemes could turn people lazier more easily and fail to realize the worth of getting it on their own. I am not such cruel against people enjoying the free of cost things that at least of what we experience and enjoy greater, but what I think was by creating certain ways or strategic could lead them to buy things on their own, interest and hard work which could make them realize the worth of buying. I am not in intend to blame the government or people, and who won’t buy when something is given free of cost, but what significant is how well it meet there real basic needs. What I just like to say simply is, show the way to destination let people approach themselves and they will know how worth they are and understand the importance. There are many wonderful schemes announced and how well they take center stage is beyond doubt and elder people should come out by not just justifying the party and persons alone but how well they cope upon with a vision. The other day went out with a friend along with parents and it wasn’t a destination based but just a wander across ECR (east coast road) and to find a decent place for our lunch out, which is our second time to go outing together. 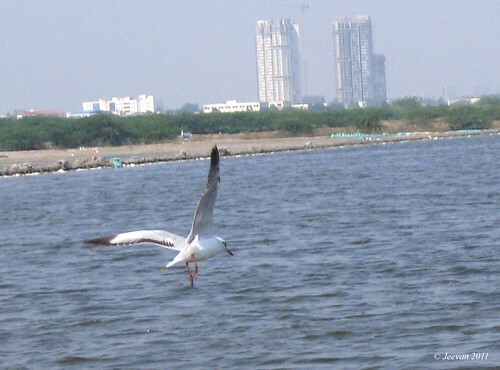 We come across the backwater off Kovalam and glad to see a bunch of sea birds flying so close and catching fishes and flapping frequently around the area in search of. 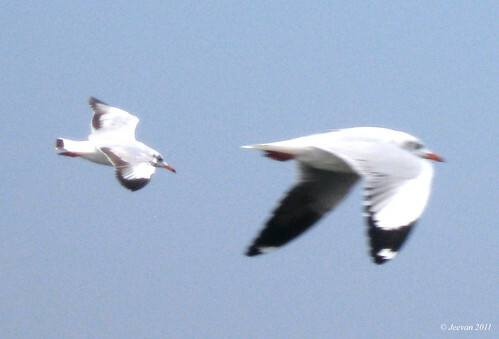 I tried by best to capture the birds that were closely come to fly and landing on water and it is the first time I see seabirds, which I later come to known as Black Headed Gull. Since water stagnant was less, the salt pan has set path for storing salts and a little black cormorant stretched leisurely her wings to put dry in the air and it was a pretty scene to see it stretched for long. After relaxing a while and chitchat for long after our lunch break in one of the casuarinas groves off ECR, we stop for a route to the olive Island which is in one of my wish list to check that always attract me every time I come across the Muttukadu. I had took various attempts to find route for this Island but at last get to check it with the help of the friend who encouraged me to try a private gateway that lead to a resort which is under construction. I never know before until check the island that it has been in active sometime ago before a couple of constructions took place, including an underdeveloped Olive Island resort. There are evidence of a rundown fisheries farm in the island and remaining pans still alive with the growth of prawns and for collecting clams, which we aware through a bunch of guys loading there sacks of clams and few have already set to fire the clam curry on spot. The island wasn’t much pretty as I expected to be seeing from away, with a row of coconut trees and lagoons in solitary attitude. I felt it was too late to land there after certain space of it was brought into a private resort and the road where narrow with a small shutter to exit in or out water due to high-low attitude. 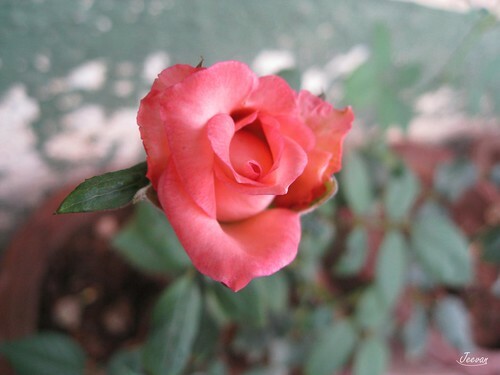 With a confine sate we drive home after purchasing few rose plants from a nursery to replace the dead ones, which no more withstand more than 6 months and already one had gone in them and remaining ones are ready to bloom out of bud! The friend whom joined with us is none than Karthik’s Mom, who gave birth to a beautiful mind and brilliant brain and who’s our family friend for some time now and hopefully being a caring mother forever. 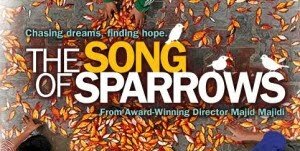 Watched this Iranian movie (The song of sparrows) which comes in an English subtitle was a simple yet affective story of a man who works from a countryside ostrich farm near Tehran with a beautiful family of five, when one of the ostrich escaped from the farm thrown him out of job and who drive to Tehran to repair his daughter’s hearing aid get chance to drop a fellow at his destination which followed him to take the bike taxi as a profession and thus how changes his attitude and realization, caress the remaining story. With the title, the song of sparrows, showcasing the largest bird on land, ostrich, is something unexpected but yet so real how it escape from the farm and the way used to trace the bird was interesting and I know now that ostrich too has fabulous feathers and not to forget the end with a spectacular sight of ostrich dance which twist its neck back to attract mate. Karim, the head of the family portrait the familiar father character well and couldn’t differentiate by country or language and so was his acting and speaking weren’t like apart from our neighborhood cinema. The movie defines how own things and money take chance to change a person’s attitude from being generous and honest and without going deep in emotion the realization take place beautifully into the mind of a man when he fall down to wake up with the support of others. The children part in this feature film is the real enthusiastic and fun, regards touched by their passion for fishes and the wish to clean the septic tank to grow fishes comes as a surprise when later found it to be pristine clean. The most scanning scene comes when boys lose their balance and dropped the tub full of fishes on the pavement is a great cause of desperate to see how fishes wiggle to survive and the boys wipe away the fishes into the roadside canal since tear dropping. At last to display the sparrow regard the caption, the Karim’s kindness towards the bird which caught into his house by helping it to fly away after its attempts through the glass window even he find it hard to open the door with his bandaged limb. The movie also bears some nostalgia and one of it cheers the memory of adjusting TV antenna on terrace and thus shouting from downstairs whether it is clear or not – the father son compo is lovable here. It is a very pleasant movie to watch along with our families and mom also showed interest watching the movie in-between her cooking gesture and if missed a scene or phase she ask me what happened next. Thorough it was beautiful and I enjoyed the simple gestures even missing subtitles and want to check the other presentations of the director’s Majid Majidi, who has some enchanting titles as reliable. It looks like close to coincident to watch the movie with World Sparrow’s day ahead for Sunday (March 20)! No need to say how intense and rage was the waves washout Japan after a strong earthquake which we all see on constant videos, want us to share mourn and set condolence waves to reach our fellow beings who suffer from the greater devastation and indefinite loss of lives that we all wish to come into cease. The thoughts have been around them these days and keeping in touch with news about the rescue operations and wishing the nuclear reactors are prevented from radiation which cause a greater alarm to people who suffered a lot and we no more to see them affect with the explosion and fail to cool reactors. The tsunami has one again make realize at large how wealth we are couldn’t rescue from this disaster and seems precaution has helped them to save lot of lives except those lose to waves. 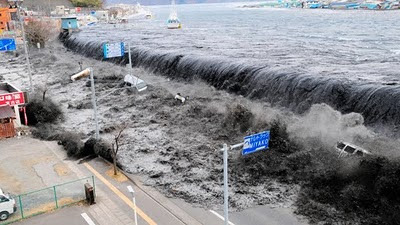 Earthquakes and tsunamis are not new to Japanese who set their lives on motion and often trembles are an example to be courageous and rise from where lives have been shattered to ashes and debris and come foremost in line of technologies and ideas are sure to prove again they are no fainter. Couldn’t avoid thoughts seeing the tides crush through sand while at beach on Sunday, we talked and remembered about our devastation from Indian Ocean tsunami which we are somehow glad to be unlike Japan which washout about 10km offshore is something partial to close Chennai. I am somehow fear to waves from childhood and hardly have memories standup at sea waves and after tsunami I am little more scared if tides are unusual or rage. It’s really hard to image life without electric which we all entirely depend on need and even an hour current cut cause annoy and disturbance but there millions without electric is seriously a problem and lack of water to drink and lose of homes and livelihoods has brought life to the edge with minus temperature to survive. More over the scare over the leak of nuclear reactors has began to threaten people immensely sending away wakeup call for every nation to make sure their reactors are secure to withstand certain disasters. Things happen and we couldn’t change or stop the reaction and we are to learn lessons how to survive when such disaster strike us somehow. Let hope all our heartfelt wishes and condolence rays console their unconditional lose to waves and prevent radiation. 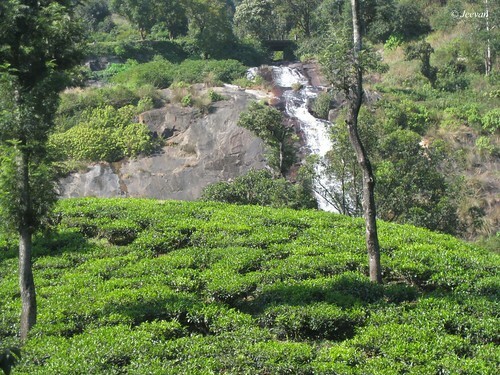 Amid the green gardens of tea estate, flow’s this beautiful waterfall enchants with an outcome name that refers to the estate it belong to in Valparai near Coimbatore. 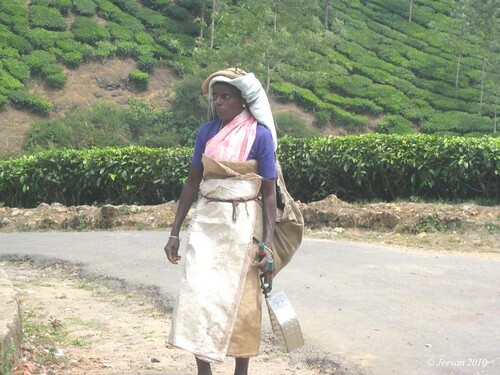 Along the way it’s very pleasant through the estate situated among the scenic location, the estate comes as a first glance of tea garden with admiring winding ghat section while climbing on way to Valparai. I get to spent sometime around this estate after late lunch afternoon and I was pretty moved by the cool wind blows off silently to sense and coming under haven of mist spread zone frequently, it rather always cool and clouded. I had been to Valparai twice and have been checking this location for some time and it remains either cool or sunshine which is frequent exchange here cause very pleasant in attitude always. Somehow I miss those wonderful shots shoot at this place of cloud covered mountains due to mystery error which erased certain pictures from my camera which I feel those moments could never restore except remembering. It wonder to see how people climb down and on the valley then in blinking seconds through the narrow, uneven, zigzag pathway between the tea plantations even its obvious that practice put them on right path. The Waterfall Estate holds a wonderful bungalow which I want to check sometime hearing it’s enhance chance to experience an wonderful vacation, staying amid the mist spread zone and valley view lawn. The other day while climbing down the hills, we checked the hut cafe run by the waterfall estate to have our last sip of tea before leaving away the fabulous climate across hill stations. 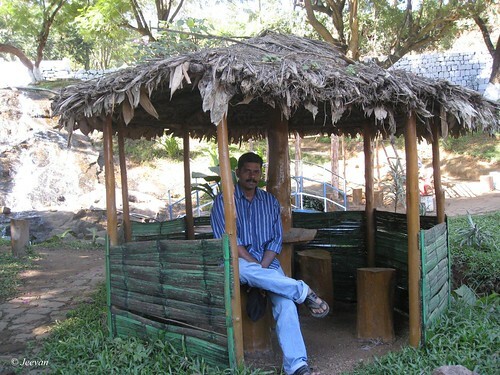 The hut cafe attract us thought its mini falls besides its park like setup with couple of huts and a small arched bridge and more than the taste of tea, it’s the location and glistening green leaves reflect to sunlight get observed. I have covered almost places across Valparai but the drive towards it seems never ending and still has lot to share and discover in this heavenly seven. What I think about women is right or wrong but I have thoughts to share with u about women who’s our profound desire and without women no man can survive in this world and they are our source of life which dwells around them. First as a mother we couldn’t compare any other relationship parallel to her and what made women so special was because being womanhood and thus becoming motherhood is consider to be so scared and venerable and according to a child she’s a livelihood. There is no way a man could live without women and he need to come across her at every instance as a mother, sister, wife, daughter and overall as a friend man lives depend on women and of course women to men. Just being a son I could only talk about mother, who’s behind and in front of my life to keep me sustain and I couldn’t think a world with my mother and even in my dream I couldn’t survive without her, because she’s my life and no one could part me from her in this inevitable world. As a brother I don’t have a sister, except cousin sisters I don’t have someone to communicate personally or consider to be my sister. Whose fault is this I don’t know! Lol. With often or sometime communicating with them I understand the sweetest essence exist through their abundant and exuberating concern and love and desire is consider to be never adjutant to any other relationship in this world. Being in there care and concern is rejuvenate and I always love to be along with them and they behalf consider me as a friend and fellow brother to share things that excite and enthusiasm them. About wife, it’s not in the list of my concern or wish and never desire for a woman except dream, imagination and crushes which consider being common among men and women and inspires lot of attitude to write poem or create characters unrealistic despite concern. I too dream a lot about women and never take it too serious or concern to get disturbed or depressed later to struggle with mind, but I have obvious reasons to be like that which is in our genes and gender to be so. I have a sweet and cute daughter in my dream with who I play and grow up according to my knowledge and trend with my special concern for her to be on my interest and how I like to see my daughter grow up unaffected by her character and giving quite freedom to realize her dreams. I never think women is lesser to man and I realize that women is more sufficient than man and incredibly mysterious and bear unbearable trouble and pain we fail to realize or tried to understand! I had and have some friends in schools and blog whom were so close to me than men and I really treat them as my dear sisters and friend and rarely consider to be fun loving and liberal related to reliable of knowledge and sense. I see women as an equal phase of society and growing at rapid speed of development in knowledge and profession and in many fields according to their immense ability and create a Wow (world of women) where they could stand on their own and fight for their rights and amendment, not alone for themselves and also for their wow community. Wow… what a species women! Congrats women for being there as our well wishers and hope the world will realize your individual freedom and treat u as a fellow human being and considering your facts and knowledge you were at the furthermost advanced in education and professional wise and continue to grow furthermost defeating man in every column they ruled the organization. Whatever knowledge or ability wise we praise you, you are the most wanted women where our hope for future is defined and design by you and no one could forget this easily so as uneasy to say in few words here. Love you dear women! 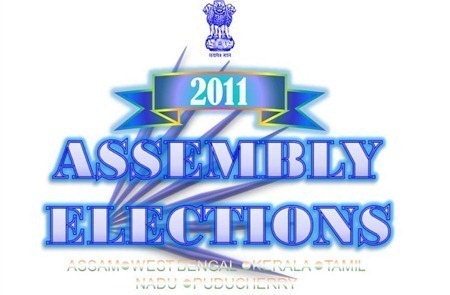 பின் ஏறிய பிறகு தலைக்கனம் எதற்கு? 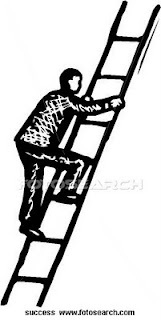 then y haughtiness after u climbed? don’t fall, in head weight! p.s. I wrote this poem while thinking about how people become haughty after reaching certain stages in life. It hurt to see how people change their attitude like a status message in messenger and publicizing themselves as if they have achieved sophisticated and forgetting the path they have traveled this distance and touched the attitude as if they gaining everything on their own and at a moment experience. Could people become that much selfish to even forget their little past that cause their present and gonna be reflecting in their future and how can they simple deny and act like nothing had happen in the past and everything happened because of their quite exhaust. Too much to say about, but no mind to share about anything that exhaust like someone who finish off everything at a moment and relax while being comfort. While just relaxing in the courtyard of our apartment complex in the evening and listening to the birds that chirp to fly across the sky fabulously and refreshing in the presence of mild wind and check through the flower pots thoughts peek like a bird from the nest box. 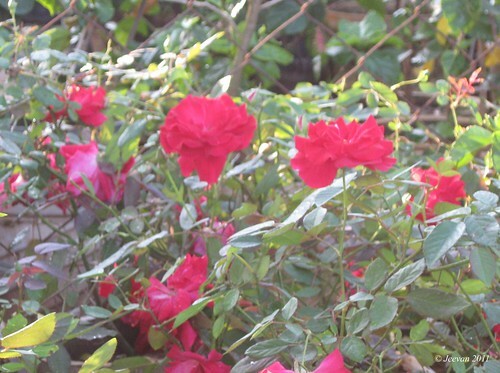 I was just thinking about friends and a quest rose ‘like a pretty rose bloomed in the pot’ that what it has been or mean… sudden a phrase read from school days come to mind which is ‘A Friend in need is a Friend in-deed’. I wonder how many friends are there in this world comes to do some deed when we’re in need and I am not here to blame or mention anybody and I am not in a mind or situation to expect someone to help me… and if nesecerry I would certainly ask any of you on a need. So be ready! Ha ha… But I could understand that everyone could not attended always everybody on their need and situation play a vital role to do so and even a situation comes on favor there are something need to be cleared before expecting from someone. A true friend would come even before we ask for something by understanding our need and a friend who run away in scare of helping or even say a single word as sympathy could not even consider be a man. A friend is not the one comes under the category of only helping in need but a man’s world extend beyond his family is next by friends. Once I left the school, no one come in search of me so far as friends and even those found on Facebook could not respond me even as trash and I had never friends after that unless I open my blog to discover a new phase of world waiting for me to lean friendship. At initial days I got a lot of friends through blogs and I was in extreme happiness and pleasure to get so many friends without being having one. As we all sail through blogging many friends redirected their path and cease partially on way inevitable to unreasonable conclusions and we can’t say anything about them since us unaware about their situation, sill some friends stay back beyond their blog blocking attitude to keep in touch with me through mails and phone calls and seldom home visit. Today I have friends to be less or more to support me and cause to be reliable virtually and really depending upon facts and personal knowledge and liberal. There are friends still omnipresent from beginning and continuing to be so hopefully sharing so many things day to day and it’s an immense pleasure I could not describe in words means so much to me. I couldn’t point who and who they are and a true friend could understand by themselves! Thanks everyone who supports me here and encouraging my thoughts even they are debris to recycle and correct me directly or indirectly to sail ashore safely or put on right path beside. 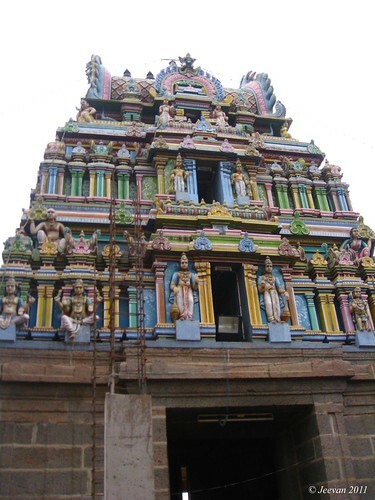 On the way back from Sembarambakkam Lake we checked the Kundrathur Murugan Temple which is located on a small hillock positioned between the Poonamallee and Pallavarm section of suburbs of Chennai. 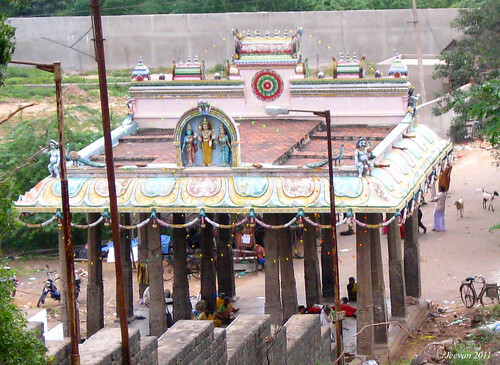 The temple is dedicated to Lord Murugan whom according to legend has stayed in this hill during his travel from Thiruporur to Truttanigai – one of his six homes generally known as Thiruthani). The time we checked the temple, its sanctum has been closed and parents went around its corridor and I stayed back looking for pleasantness around the unclean environment. From the hillock we could see the far away lake and get to view the places around the hill. 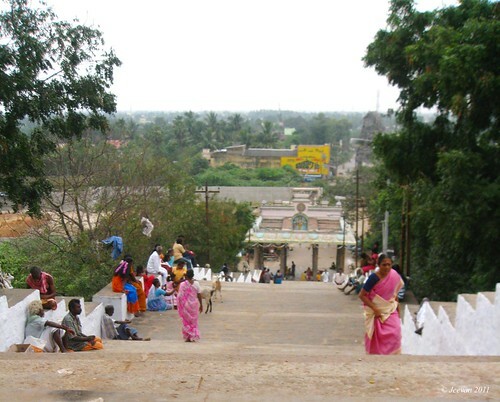 The small hill also has a road to temple top for peoples comfort and those who can’t climb the stairs. What special about this temple they say was that Lord Murugan is seen along his both spouses Valli and Deivanai but one could not see him with both of them at same time viewing from side. 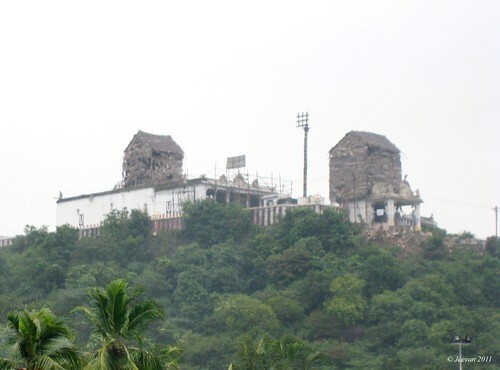 Whether the temple is renowned for Lord Murugan or not, the hillock is popular for cinema shooting and many Tamil movies had been captured here, and thus what interested me to check this place for very long. 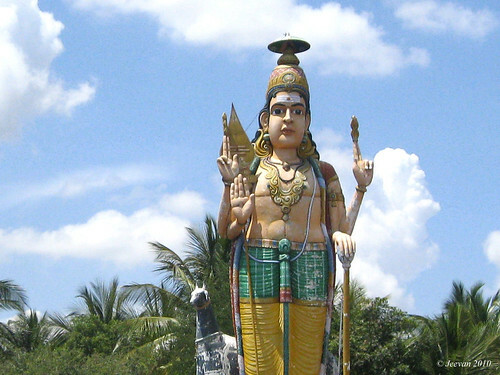 Built in the period of Chola dynasty by the King Kulothunga Chola-II, the Murugan in this temple is said to be north facing unlike other temples in Tamil Nadu. Along the way back home we passed the Thiruneermalai which is few km from here is also a hillock temple dedicated to Lord Vishnu and it also has a foot temple similar to hilltop. The time we come across the temple it was on its renovation process and the foot temple tower was paint in bright colors and was closed for public visiting. 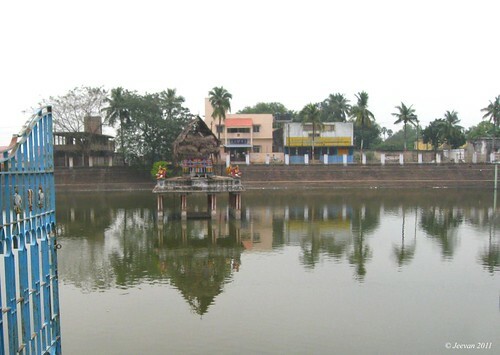 The temple owns a tank on the other side of the road, which has four sides of road called Maadavethi has planted by coconut trees and people residents. It was the time of margazhi (winter month in Tamil calendar) and so every gateway of the resident was colored by kolam and tank being filled at least cause a wonderful sight with the shadows of inner mandabam (hall) and things around. 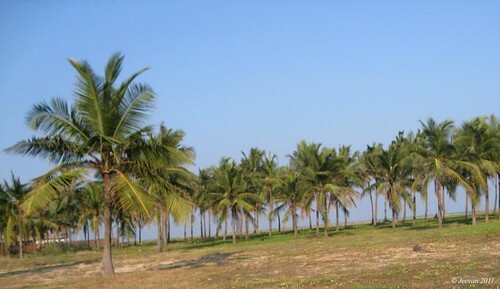 This hillock and temple tank too is on the list of cinema shooting and the tank had been on many scenes as background and one of ‘Koundamanis’ renowned coconut comedy comes under this shadow and the hill stairs were on fought between villain gangs and heros.